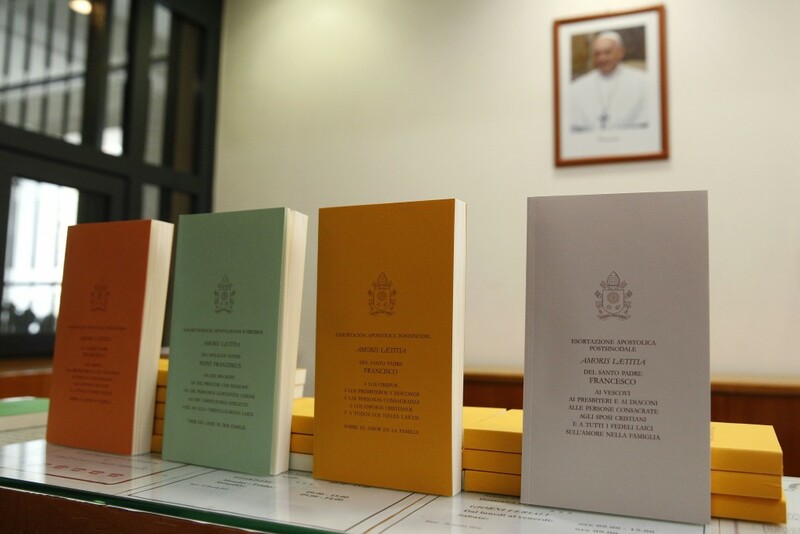 Copies of Pope Francis’ apostolic exhortation on the family, ‘Amoris Laetitia’ are seen during the document’s release at the Vatican on 8 April. The exhortation is the concluding document of the 2014 and 2015 synods of bishops on the family. Photo: CNS/Paul Haring. Archbishop Timothy Costelloe has last Friday welcomed the release of Pope Francis’ Apostolic Exhortation entitled Amoris Laetitia, The Joy of Love. The 263-page Exhortation details the Holy Father’s conclusions, following the two synods dedicated to the theme of the family: the Extraordinary Synod of 2014 and the Ordinary Synod of 2015. The Archbishop described the Exhortation as a remarkable gift for the Catholic Church throughout the world. “The Exhortation is explicitly addressed to the whole Catholic community, but will be of great interest to many other people as well, because it speaks of an emotion each one of us, as human beings, experiences,” he said. The Exhortation is made up of nine chapters, subdivided into 325 paragraphs, with 391 notes and the final prayer to the Holy Family. The Archbishop explained that the Pope has not changed any definitive Catholic teaching and indeed has no authority to do so. “What he has done is call for a process of careful and faithful discernment of each particular situation, in the light of the Church’s teachings,” Archbishop Costelloe said. “A key principle underpinning the Pope’s thought would appear to be the idea that, while it is never the role of the Church to abandon, side-step or water down the high ideals of the Christian life, it is the role of the Church to accompany people on their journey of faith, supporting and encouraging them as they strive to live up to those ideals, while never condemning people who find it difficult to do so,” he said. A second key principle, continued the Archbishop, is closely aligned to the first, and appears to stress the distinction between objective morality and subjective responsibility. “While the demands of the Gospel and the teachings of the Church may be clear, the capacity of people to understand, accept and embrace these may be limited by a variety of complex factors. “In such situations, which are very common today, the Church is called to accompany people on what may be a long journey of discernment, as they seek to respond to God’s will for them. “The Pope writes that ‘without detracting from the evangelical ideal, there is a need to accompany with mercy and patience, the eventual stages of personal growth as these progressively appear’,” (par 308). Speaking on the discernment of people living in what the Church has termed, ‘irregular situations’, and how they should be incorporated into the life of their local Catholic community, the Archbishop said that the Pope is clear that this is an urgent task. “Chapter eight of the Exhortation offers a variety of principles on which to ground any decisions. The Archbishop emphasised that the whole document must be seen as a unified whole. “It would be a mistake to lift certain phrases or paragraphs out of their context and build an interpretation of the whole document on a few isolated parts. “At the same time, the Exhortation itself needs to be placed in the wider context of the Pope’s insistence that ‘the name of God is Mercy’ and that ‘Jesus is the face of the Father’s mercy’. The Archbishop concluded his preliminary reflections by commenting that “as a Church, we should be enormously grateful to Pope Francis”. “In Amoris Laetitia, he is calling us all to a comprehensive fidelity to our faith. “We are being challenged to walk that difficult path which must hold together fidelity to the full truth about Christian marriage and the family given to us by the Lord, and fidelity to the same Lord who would not condemn the sinner, who exercised unfailing patience with His failing disciples. “Who met people where they were and entered into relationships of love and understanding with them, enabling them to gradually leave behind those things which were preventing them from receiving the gift of full life He was holding out to them.